When saving the file in Word, Excel, PowerPoint, Publisher, Visio and other applications in Microsoft Office 2010, Office 2013, Office 2016 or later to OneDrive or OneDrive for Business (via SharePoint or Office 365), the Office program will prompt a dialog to login with a work or school, or personal Microsoft account. UPLOAD FAILED You are required to sign in to upload your changes to this location. Your changes were saved but could not be uploaded because you are not signed in to the server. Click Resolve for options. The error happens despite user has signed in to his or her Office 365 home or business account on the Office’s Account setting. To make matter worse, the sign in required error happens even when you’re not trying to save to OneDrive. Both saving to local computer and cloud OneDrive encounters the same issue. The constant prompt to login is annoying despite the fact that the file still get to save properly even when you’re saving it to OneDrive by just closing the login prompt. In any Office app, e.g. Word, Excel or PowerPoint, open the File menu and go to Account. Under “User Information”, sign out of all existing accounts. Exit and close all Office applications. 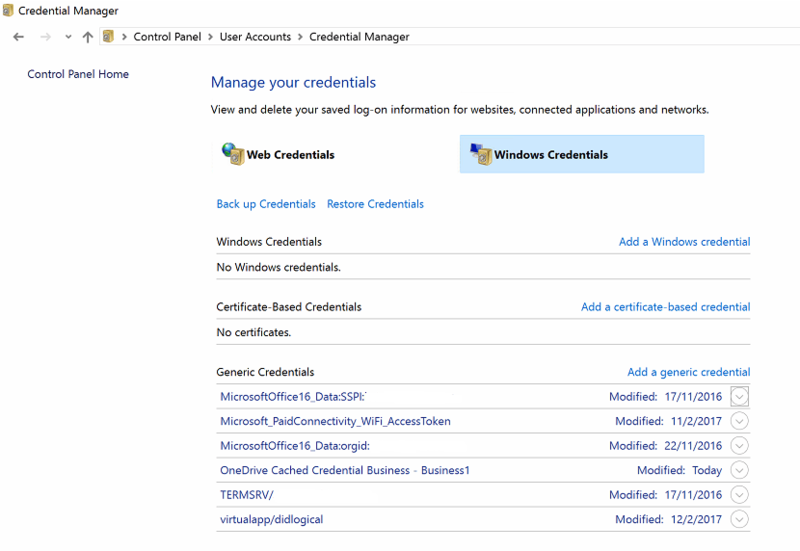 Navigate to User Accounts -> Credential Manager. Go to Windows Credentials tab. Under Generic Credentials, expand the Office credentials, and click on the Remove link to delete them from the Windows Credentials storage. Office credentials should start with MicrosoftOffice16_Data: (for Office 2016), MicrosoftOffice15_Data: (for Office 2013) and so on. Open the Office app, and go to File -> Account. Under “User Information”, sign in with Office 365 account.